Hello creatives! Wow, is it already the final post in the 3-month challenge? Time both dragged on and flew by, depending on my state of readiness at any given time. 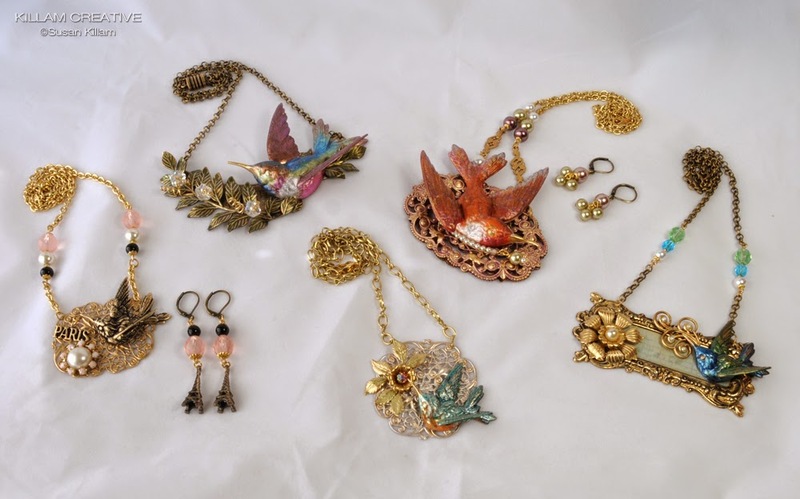 The B'Sue Boutiques Build A Line Challenge is to create a new line of jewelry with B'Sue supplies (of course!) consisting of at least 5 pieces. The line must be cohesive and recognizable as the Killam Creative brand. It should fall in a specific price range and be reproducible. Easy peasy, right? Err... no. It was a fantastic challenge, but a challenge indeed! I made it through with the support of 54 others building their own lines. You'll see the complete list of my cohorts at the end of this post. I'd love it if you could visit them, too! My line is called Flights Of Fancy. 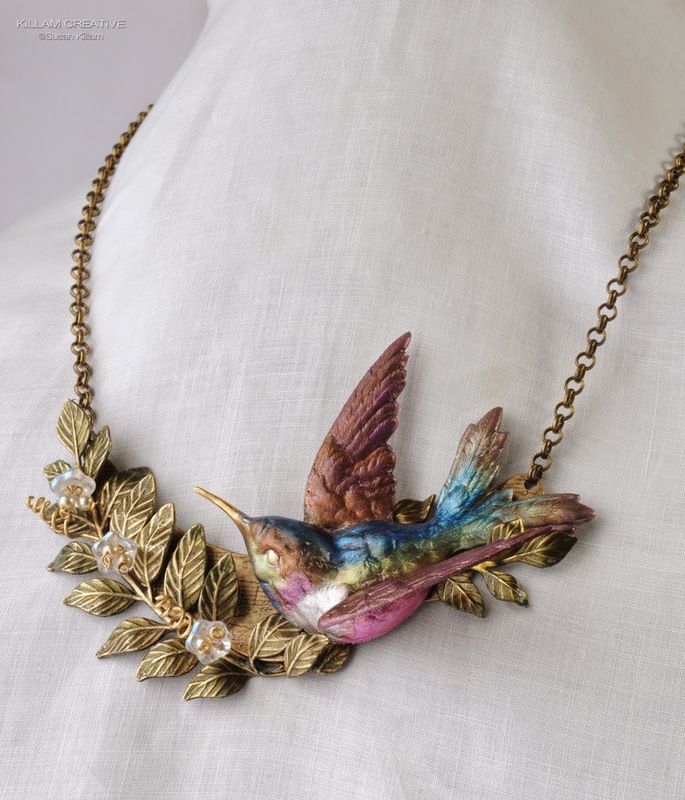 Fancy is a hummingbird who has extraordinary adventures and strong loves. Today I will share with you some of each. This first one finds Fancy in Paris. Oh la la! 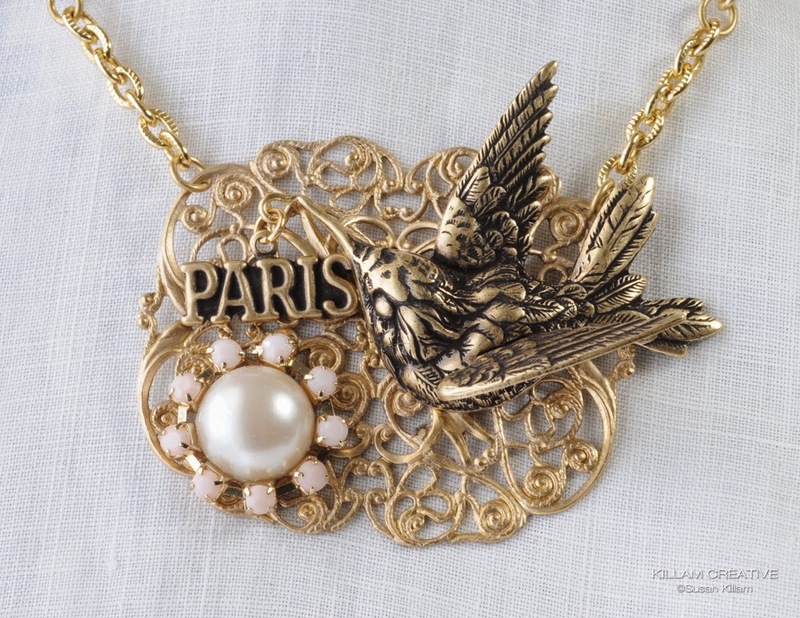 It's barely visible in the photos, but Fancy is holding the Paris charm in her beak. Along the chain are pink, black and pearl glass beads. This is a fun and favorite color combination for me that "feels" chic. But then, I'm a child of the 80's, so..... 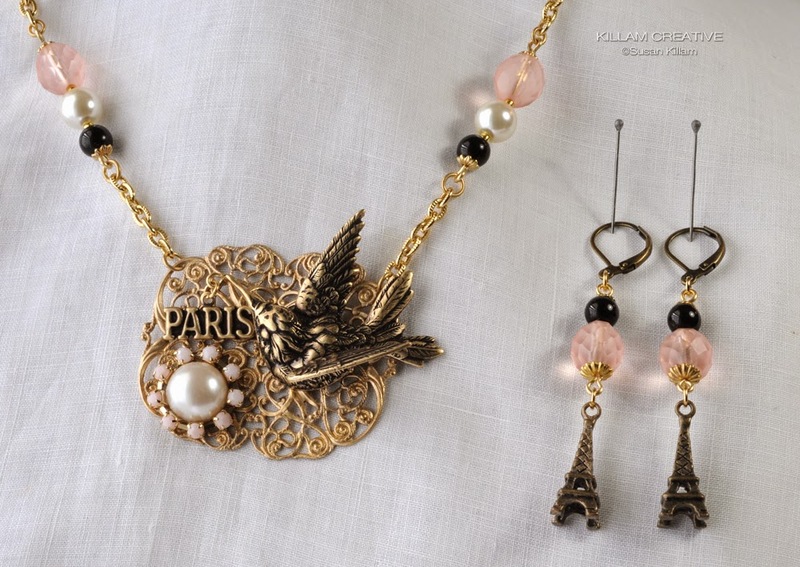 The coordinating earrings feature the same black rounds and frosted pink Czech glass beads, as well as Eiffel Towers. Perhaps a "seine" from both the Left Bank and the Right Bank? Yea, I know... really bad joke. The next stops on Fancy's adventures are seasonal. In this first piece Fancy embraces spring just in time for today's equinox. 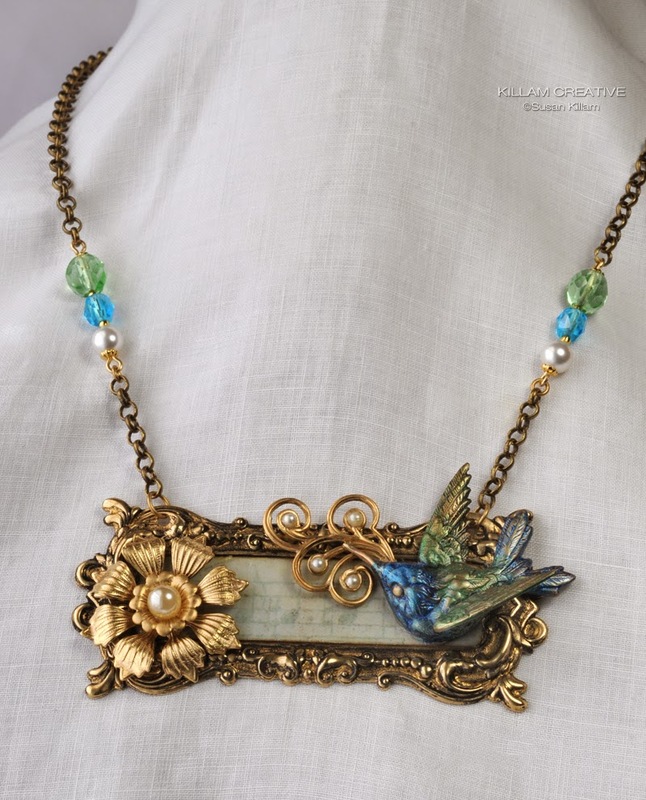 The colors are subtle -- the filigree is white washed and the leaves have the barest touch of green. Nestled in the wee flower is a pink aurora borealis center. Fancy is wearing her teal and orange colors for this spring necklace. Here's a view of the back. Next I'd like to share one of Fancy's favorite hobbies -- singing! 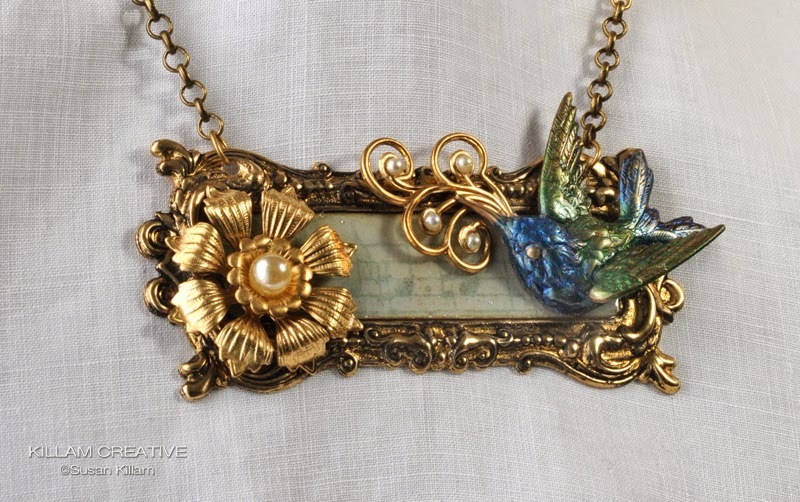 Inside the frame is a sheet of music paper coated with resin. Beautiful pearly notes swirl from Fancy's beak. I wonder what song she will be singing today! Last but not least (especially since this is only the beginning of the Flights Of Fancy) is my favorite piece in the collection. It's also the only one without a name, although it makes me think of our annual Baltimore Symphony Orchestra subscription. I always wear pearls, and she is, too! It's funny for me to call this the favorite since I shy away --no, I RUN away-- from orange. This one just has my heart. I can imagine wearing it a lot during the summer! 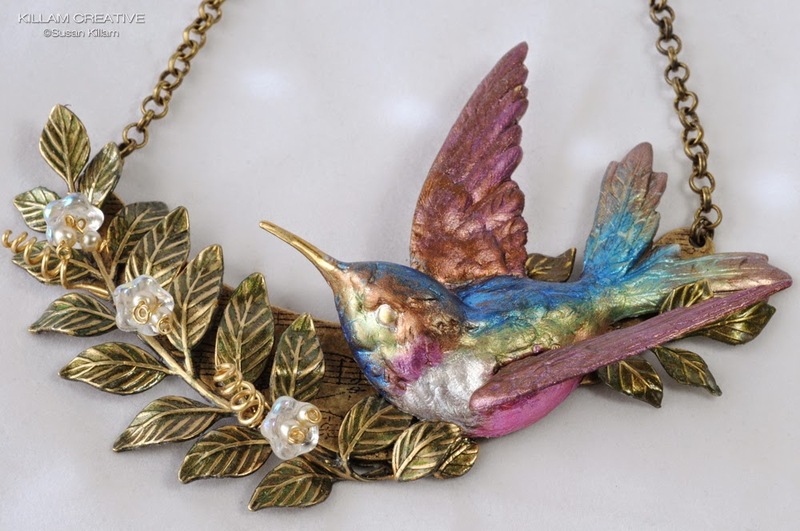 Fancy is modeled after a Rufous hummingbird, which is mostly orange with touches of purple and white. Fancy is hand colored with acrylic paints. 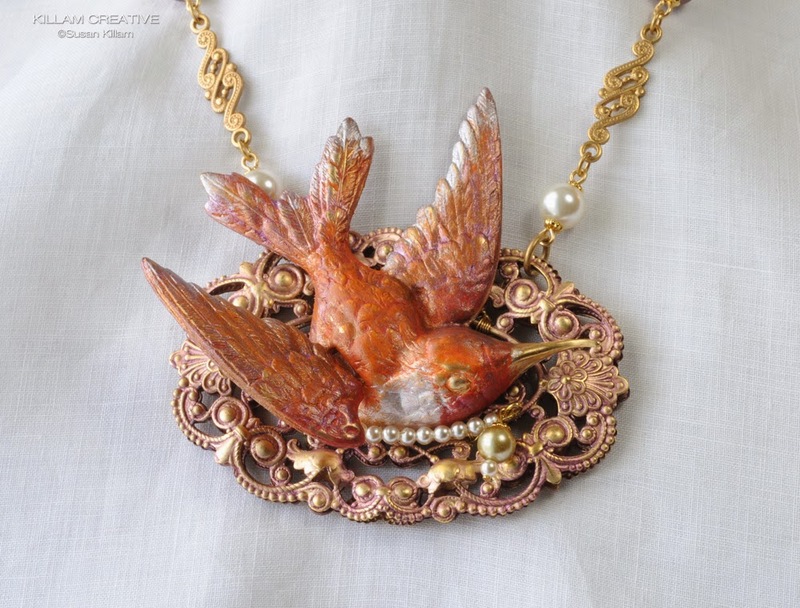 Her gorgeous filigree nest is colored with a combination of Gilder's Paste and acrylic paint. See the green pearl charm hanging from Fancy's pearl necklace? It matches the wee dangly earrings! Here's a view of the back filigree. 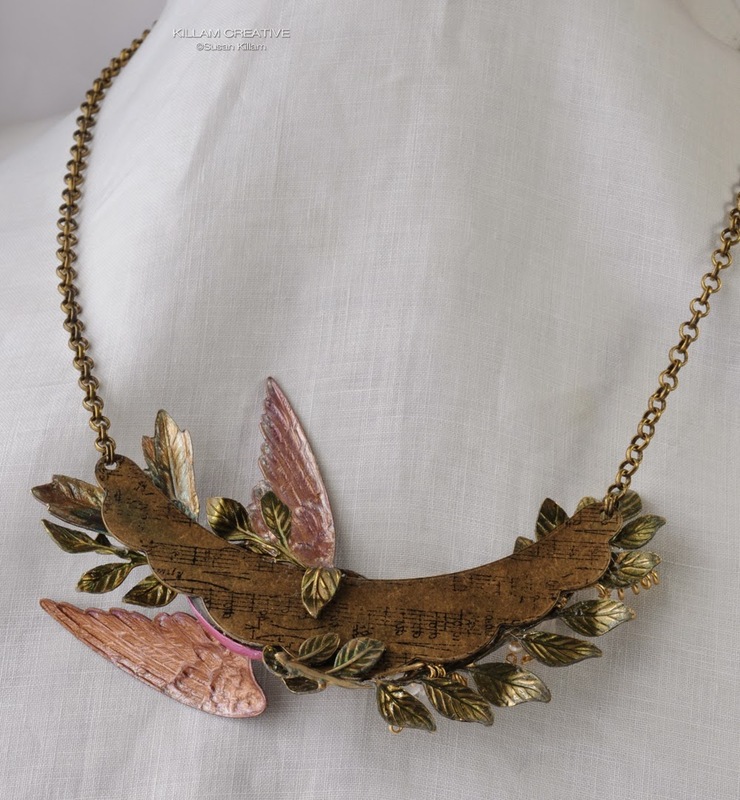 It's also colored with a combination of Gilder's Paste and acrylic paint. 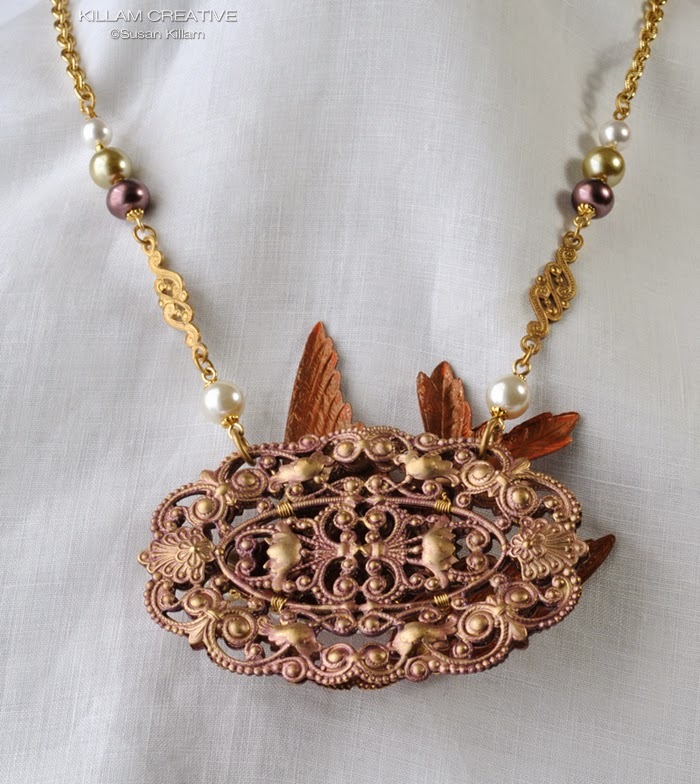 This filigree is wired to the front piece for a lovely finished look. The whole group together. Eventually I will have bracelets in the collection, as well as Fancy earrings. There's a lot in store for this adventuresome girl! When this challenge came around I needed something new. 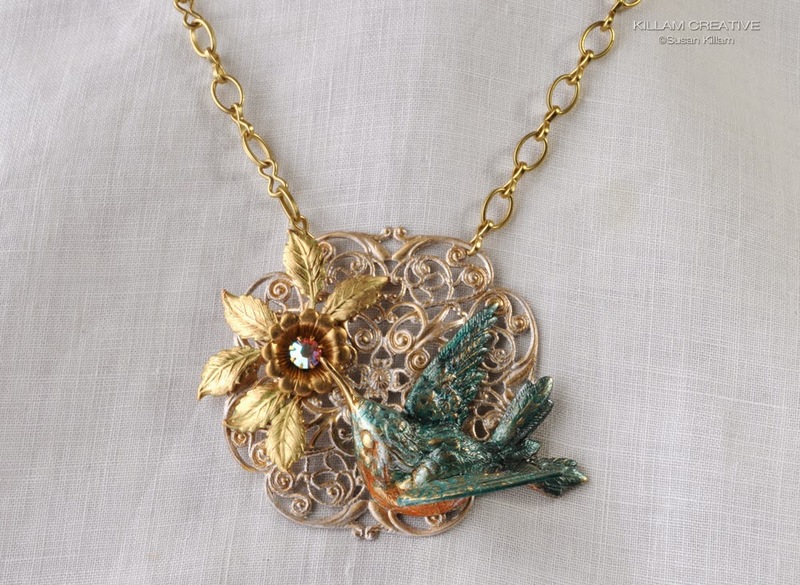 I fell in love with the brass hummingbird stamping from B'Sues and thought I could make a go of a lower priced line to add to my Killam Creative Studio shop. 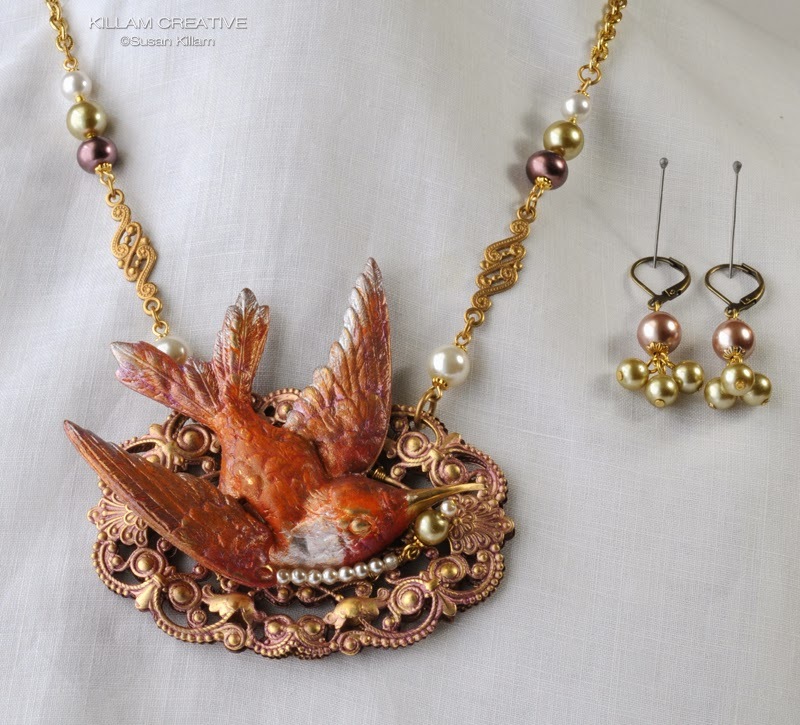 My love of assemblage and 3D art fit well with the "collage/assemblage" type of jewelry I envisioned. I didn't expect the bumps along the way and didn't anticipate the caring and supportive group of ladies I found myself amongst. This has been quite the adventure and I feel incredibly lucky to have them. Thanks so much for your support during the last three months! I'll be preparing for a paper-based project (cards, shadow boxes, altoid tins) show for the next month and will switch gears on the blog once again. Just like Fancy, it's always an adventure around here! Here is a list of all the challenge participants. If you can, please visit everyone to see their new lines. We've all worked hard over the past 3 months to get to this point. Thank you! 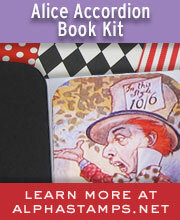 Susan Killam Killam Creative <--- You are here!